Short 6 minute safe easy walk – all flat and all sidewalks – Public beach with restrooms and showers. The Sheraton has snack bar open to the public. Surf, snorkel, swim or just enjoy large quiet stretch of sandy beach. There are many golf courses near by including one of the most famous, Poipu Bay. The hidden (in plain view) perk at Poipu Bay is the $15 driving range/putting green/ chipping area – which you get unlimited balls and can play all day for the one price! Also they have twilight prices for golf after 2:00 at a reduced rate. About an hour north at Princeville are more courses as well. Princeville is known for its golf courses, but it can be very rainy up there – so be careful about booking too far ahead without checking on the weather. 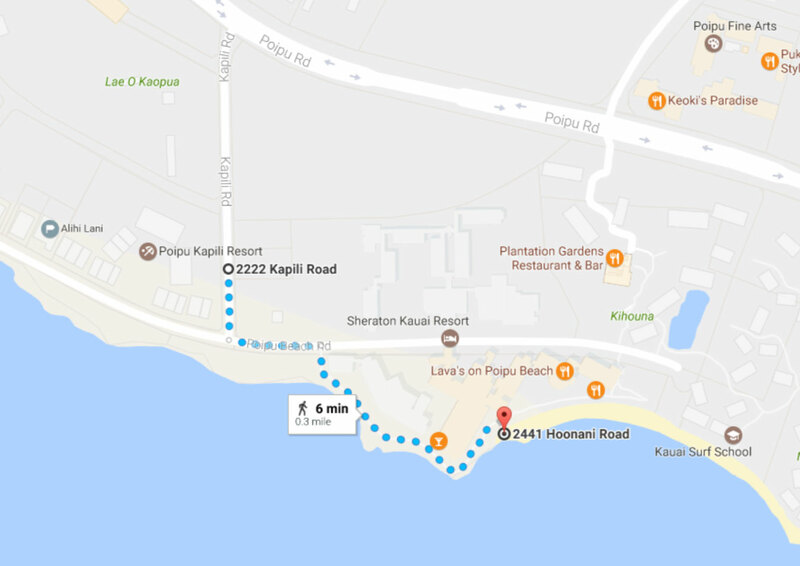 It takes about an hour to get there from Poipu. Kukui’ula Shopping Center easy, flat walk in 11 minutes – lots of restaurants and shops! Fabulous ocean view walk, less than ½ mile to many restaurants from casual to Hawaiian elegant. Shave ice, ice cream, coffee, shrimp, organic groceries, sushi, tapas, Mexican, fresh fish and more. Plus many wonderful unique shops and weekly farmers market.